A new breakthrough, long-term diet study was recently published in the American Heart Association Journal Circulation on measuring body fat! This diet study used magnetic resonance imaging (MRI) technology for the first time, measuring changes in body and organ fat during 18 months on a Mediterranean/low-carb diet, with and without moderate physical exercise. MRI is a diagnostic technique that produces computerized images of organs and internal body tissues using a magnetic field and radio waves. This is the best approach to date for measuring body fat, compared to weighing people as a result of diet and exercise. The scale, skinfold calipers or underwater weighing isn’t giving you the whole picture! The research was conducted between Ben-Gurion University of the Negev and Harvard University. The research group was led by Drs. Iris Shai, Yftach Gepner, Ilan Shelaf and Dan Schwarzfuchs from Ben-Gurion University. Dr. Meir Stampfer was also a lead author for the study, and is from the prestigious Harvard University. Dr. Stampfer is a well-known authority on nutrition and obesity. The study analyzed the implementation of positive dietary changes and how this could help in reducing body fat, particularly visceral (abdominal) body fat. The Mediterranean low-carb diet was significantly superior to low-fat diet in decreasing fat storage, including visceral (deep abdominal) liver and heart fat. High visceral fat has been shown to increase metabolic syndrome, inflammation, cardiovascular disease and diabetes. Losing deep subcutaneous visceral fat, as well as haptic (liver) fat, was associated with improved insulin sensitivity and improved lipid profile. The low-carb Mediterranean diet was more effective than a low-fat diet in eliminating fat storage. Previous studies have shown that a low-carb Mediterranean diet may be an effective alternative to low-fat diets. It has a more favorable effect on lipids (with low-carb diet) and glycemic control (with Mediterranean diet). People who strictly follow the Mediterranean diet tend to have a lower body mass index (BMI), which is a measure of the proportion of weight to height and waist circumference— according to a large population study led by Simona Bertoli from the Nutritional Research Center in Milan, Italy. The Mediterranean diet is high in fish, seafood, antioxidant-rich vegetables, red wine and berries rich in polyphenols, beans, lentils, nuts, legumes and extra-virgin-olive oil (EVOO) that are rich in healthy monounsaturated and polyunsaturated fats and low in saturated fats. Extra-virgin olive oil contains a polyphenol called oleuropein and can increase brown fat thermogenesis. Brown fat is a special kind of fat cell that generates heat and helps regulate bodyweight and energy expenditure. The body has two forms of fat— white fat and brown fat. Brown fat burns calories. The more brown fat you have, the more calories you burn. The capability of harnessing one’s one brown fat for fat-burning is revolutionary! The ability to get lean by producing extra brown fat and enhancing and activating existing brown fat represents a promising way to burn fat. Several landmark discoveries and approaches to this are being explored at major research centers and universities worldwide with great excitement. Brown fat research is a hot topic today! Studies indicate that the Mediterranean diet promotes metabolic health, boosts fat loss, prevents obesity and may increase longevity. (Clinical Nutrition, 2016; J of Nut Sci and Vitaminology, 2008; J Nutritional Biochemistry, 2017). In a groundbreaking, two-year dietary intervention study published in the New England Journal of Medicine, researchers found that the Mediterranean and low-carb diet was an effective alternative to weight loss. It appears to be just as safe, metabolically healthier and more effective compared to a low-fat diet. Consumption of monounsaturated fats (extra-virgin olive oil and nuts) is thought to improve insulin sensitivity, which may explain the favorable effect on blood glucose and insulin levels. Research has shown that nut consumption can enhance weight loss and weight gain (N Engl J Med, 2008). Twenty-five years ago, nutritionists discouraged nut consumption because of their high fat content. Mountains of evidence show that nuts are a healthy food that reduces the risk of cardiovascular disease, cancer and all-cause mortality. A meta-analysis that combined the results of 20 studies involving more than 819,000 people, led by Dagfionn Aune from the Imperial College London, found that consuming 28 grams of nuts per day was linked to a reduced risk of coronary heart disease (29%), stroke (70%), cardiovascular disease (21%), total cancer risk (15%) and all-cause mortality (22%). Adding nut consumption to your daily diet can have a marked improvement on your health and prevention of disease. (BMC Medicine, 2016). A recent study published in the European Journal of Nutrition cites nuts like walnuts, peanuts, pistachios and almonds help to increase weight loss and prevent obesity. Nuts are low in carbohydrates, are rich in fiber and a good addition to the low-carb Mediterranean diet (European Journal of Nutrition, 2017). Fish consumption, rich in omega-3 fats that are found in oily fish like wild salmon, for instance, are a healthy component of the Mediterranean diet. Consuming salmon twice a week improves the blood fat profile in overweight men and women— according to a study in the journal Nutrition Research (2016). The benefits were dose dependent— eating more fish triggered greater benefits in blood fats. The study found that salmon consumption reduced blood triglyceride (blood fat) and increased HDL cholesterol levels (the good cholesterol). It also benefited the size of lipoprotein molecules, which is important for reducing the risk of coronary artery disease. Regular salmon consumption is part of a heart-healthy diet. Ocean and wild fish are preferable over farmed fish. They are richer in omega-3 polyunsaturated fatty acids. For example, farmed tilapia is not a healthy fish because it is very low in omega-3 fatty acids and rich in arachidonic acid, a polyunsaturated fatty acid that can increase inflammation and is linked to a higher risk of cardiovascular disease. Be careful with tuna and swordfish! They are very high in mercury. I personally experienced mercury toxicity from eating too much high-mercury fish such as tuna! I love tuna, but only eat it sparingly along with other high-mercury fish. I’m extremely concerned about women of childbearing age who frequently eat sushi and sashimi. The New York State Board of Health did a study showing many women of childbearing age who frequently eat sushi were over the limit of methyl mercury. This is very concerning because methyl mercury is a neurotoxin, especially in the unborn and underdeveloped fetus. If you eat a lot of fish, I recommend that you get your mercury levels checked by a physician. I do this on a regular basis and stay under the limit by avoiding tuna, swordfish and other high-mercury fish. Stick with low-mercury fish such as salmon, sardines, fillet of sole, flounder, cod, canned light tuna, shrimp, scallops, crab and lobster. High methyl-mercury-containing fish are swordfish, shark, king mackerel, halibut, grouper, bluefish, Chilean sea bass and tuna. Methyl-mercury is a toxic heavy metal. The main function of methyl-mercury toxicity is oxidative stress. Methyl-mercury induces the production of reactive oxygen species (ROS) causing free radicals and reduction of intracellular glutathione. Studies indicate that daily supplements of selenium and N-acetylcysteine, (NAC) a sulfur-containing amino acid, can protect against methyl-mercury toxicity. The Thermo Heat® Weight Loss Revolution by Michael Rudolph, Ph.D. provides a calorie-controlled low-carb Mediterranean diet, 30-day meal plan and exercise program. It says that you should limit yourself to 100 grams of carbohydrates per day, or less. Processed food and sugar is off the table! The Thermo Heat® Weight Loss Revolution stresses foods high in monounsaturated and omega-3 polyunsaturated fatty acids. It also recommends thermogenic brown fat activating herbs and spices instead of salt to flavor food such as garlic, onion, mustard and chili pepper (capsaicin) to name a few. Monounsaturated fats are more thermogenic than saturated fats found in high-fat dairy and red meat. Because of ease of compliance, The ThermoHeat® Weight Loss Revolution Mediterranean Diet makes it easy to follow even when dining out. One or two glasses of polyphenol-rich red wine (not white wine, or any other alcoholic beverages) per day can have positive health benefits on the Mediterranean diet. Studies show that olive oil and certain spices can enhance brown fat and increase thermogenesis. 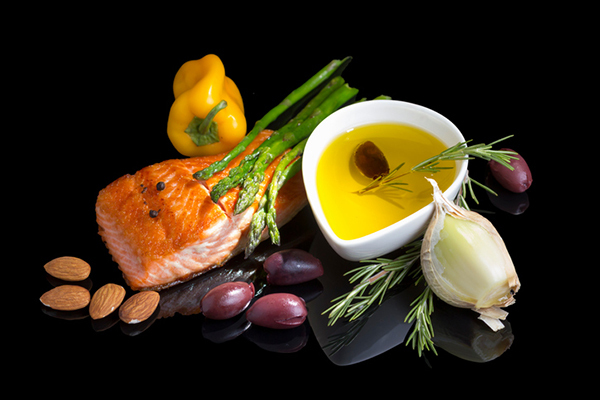 A number of studies have shown that healthy fats from nuts, olive oil and fish, found predominantly in Italian, Greek, and Turkish cuisine, have health benefits in the prevention of heart disease, type II diabetes, and obesity. Fish oil and omega-3 fats can decrease bodyweight gain and fat accumulation by increasing thermogenesis and energy expenditure. (Clinical Nutrition, 2009; Metabolism – Clinical and Experimental, 2008; International Journal of Obesity, 2002; Nutrition Journal, 2015).